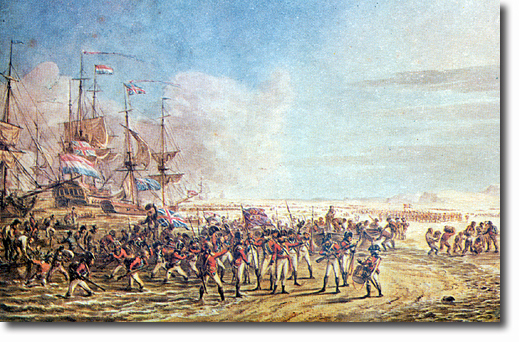 The landing of the Guards brigade took place at the Helder Peninsular on the morning of 27th August 1799. The Dutch artist, Dirk Langendyck, was probably present at the landing. This water-colour is one of several pictures of this expedition in the Royal Collection. In the foreground is the 3rd Battalion 1st Guards coming ashore with Colours flying and drums beating. The Colour nearest the beach is the Major's Colour which is supposed to be crimson but looks blue here. The other Colour is the Regimental Colour which is the Union flag, at this stage minus the red cross of St Patrick. The Colours are depicted as smaller than they should be (6'6"x6'). The Dutch ship in the middle distance has Dutch flags flying from the foremast and at the stern but also has a British Union flag flying at the mizen gaff signifying that she has been taken by the British.